The free standing cabinets program consists of a platform measuring 60 cm in depth, a roll box, and 5 open shelves of 40 cm depth (alternatively available with doors or as toy boxes). Wardrobes in the system are available in various widths with two or three doors option. 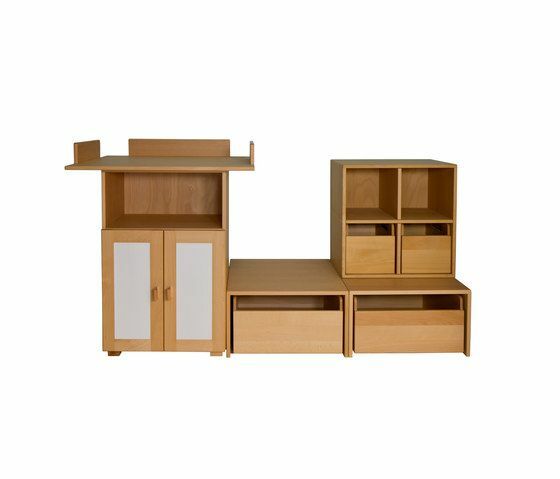 This whole range of furniture is available either in natural oiled beech or painted, stained white. We offer you the highest quality craftsmanship with all our cabinets made from solid wood. The core is constructed out of a high quality veneer with edged glued by 5mm small solid beech blocks. The doors features a frame construction with solid beech plywood panels. We offers you 16 bright colors to choose from to give cabinets, door panels and decorative circles your desired look. De Breuyn – Children’s Furniture Systems The German, family-owned De Breuyn has developed meticulously designed children’s furniture since 1986.